Enough already! I already said that I wanted to stop writing about bugs and now there have been three encounters with chipmunks! I had to wait before parking at work for one to leave the spot I wanted to park in. Then, after work, one ran across the driveway, forcing me to slow down. Now, just now, likely actually a minute or two ago I saw one run off of the deck of the pool. it is important to keep new projects protected and out of sight during the first 6-week period. 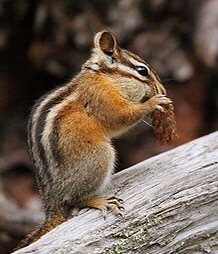 A Chipmunk has a very complex burrow that offers protection for their young (new projects) with several exits and storage chambers. Chipmunk also shows you how to store for a rainy day, protecting you for any future problems. That one resonates. I have not told anyone that I know that I have started this blog. I began this blog April 21, the day Prince died. Six weeks is right about now. Now, Gotta go have my espresso and a smoke. I just decided that I might go Netflix style and let people binge read by posting everything all at once. I’ve been struggling for a when and how to time the posts. Truth is, I write on days off, which usually includes Friday night as well, but not always. Then I calculate when I’m next writing and time the posting appropriately.